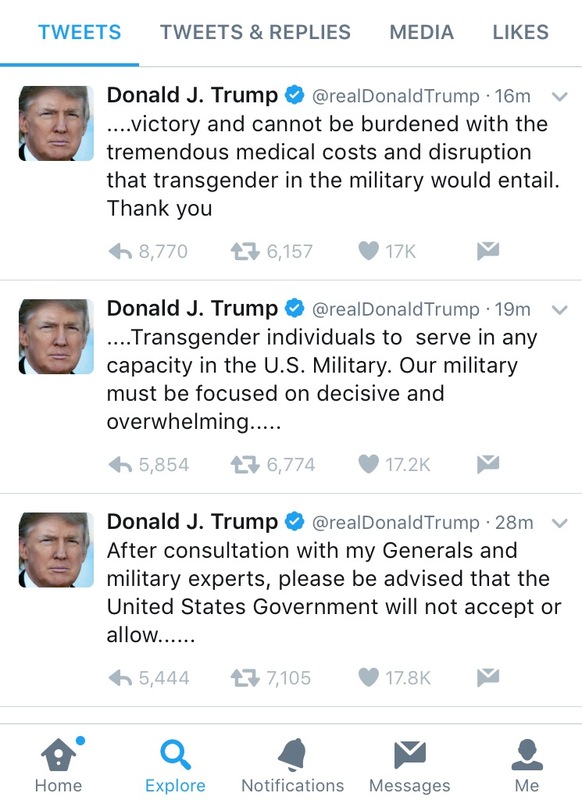 Earlier this week, President Donald Trump took to his personal Twitter account to “announce” an update that the “United States Government twill not accept or allow transgender individuals to serve in any capacity in the U.S. Military.” The reasoning provided was that the military must be “focused on decisive and overwhelming victory and cannot be burdened with the tremendous medical costs and disruption that transgender in the military would entail.” In a bit of irony, the announcement came 69 years to the day that President Harry Truman announced an end to segregation in the armed forces. In Executive Order 9981, Truman declared that “there shall be equality of treatment and opportunity for all persons in the Armed Forces without regard to race, color religion, or national origin.” While the claim of “tremendous medical costs and disruption” rising from military service of transgendered service members remains ambiguous, the commonly evidenced report is one completed by the RAND Corporation at the request of the Department of Defense (DoD) in 2016. According to the report’s estimates, about $8 million a year would be spent on gender-transition related healthcare, which is roughly the cost for four visits to Mar-A-Lago by the President. According to the report, between 1,320 and 6,630 transgendered personnel are serving in the active component (AC) and 830-4,160 in the Selective Reserve (SR). However, it should be noted that no exhaustive study has been completed to fully account for the personnel numbers. As a result, the estimated totals have come from self-reporting and non representative survey samples. Only a small number of the AC population are expected to seek transition-related healthcare, roughly 29-129 out of the total 1,326,273 currently serving in the military. As a point of reference, about 278,517 service members sought healthcare in FY 2014. The estimated healthcare cost for transgendered personnel from the Military Health System (MHS) will be between $2.4 million and $8.4 million annually—an amount that will have little impact on and represents an increasingly small proportion of AC healthcare expenditures (approximately $6 billion in FY 2014) and overall DoD healthcare expenditures ($49.3 billion actual expenditures for the FY 2014). According to the report, less than 0.0015 percent of the total available labor-years would be affected, based on estimated gender transition-related health care utilization rates. Taking into account higher estimates, less than 0.1 percent of the total force would seek transition related care that could disrupt their ability to deploy. Eighteen countries currently allow transgender personnel to serve openly in their militaries, but the analysis focuses on the policies of four: Australia, Canada, Israel, and the United Kingdom. Physical fitness standards typically do not fully shift until the medical transition is completed. Also, the militaries permit the use of sick leave for gender transition-related medical issues and cover some, if not all, medical or surgical treatments related to a service member’s gender transition. Of the eighteen countries, there was no evidence of an impact on the operational readiness, effectiveness, or unit cohesion. What remains unclear at the time of posting, is what will happen to those already serving? Will they be immediately discharged and would that be of a less-than-honorable-status? White House Press Secretary Sarah Huckabee Sanders was unable to answer that question and told reporters that the President’s decision was based on a “military decision.” According to the USA Today, Sanders could not answer any detailed questions, including whether transgendered service members would be immediately thrown out of the military—or sent home if hey have currently deployed to conflict zones such as Afghanistan. “Implementation policy is going to be something that the White House and the Department of Defense have to work together to lawfully determine,” she said. At a campaign event in Manchester, N.H., then Candidate Trump said, “Ask yourself who is really a friend of women and the L.G.B.T community, Donald Trump with actions or Hillary Clinton with her words?” The tweet from Wednesday drew a stark contrast from that speech. On Thursday, the nation’s top uniformed military officer Gen. Joseph Dunford, chairman of the Joint Chiefs of Staff, stated “There will be no modifications to the current policy until the president’s direction has been received by the secretary of Defense and the secretary has issued implementation guidance. In the meantime, we will continue to treat all personnel with respect.” The first openly gay Secretary of the Army Eric Fanning, an Obama appointee, said [he found] “it offensive for the commander in chief to say thousands of patriotic Americans in uniform are a burden.” As of yet, the Trump Administration has issued no formal policy directive to the DoD to change the transgendered service policy.